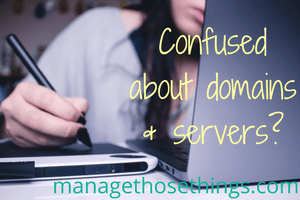 Domain names, hosting, and servers – what do I need? Domain names, hosting and servers what do i need? This is a question we get asked a lot when meeting business owners, or business start ups. Even established businesses get confused about domain names hosting and servers when they are looking at revamping or upgrading their website. Here’s some guidance for you to get you more confident to make the decisions you need for your business. When you create a website, for the first time, or re-do a website, many business owners get confused by the terminology web developers use, or what they actually need to do. Being baffled by words doesn’t fill you with confidence when you’re working hard to get your website created, and ready to go live does it? You can own as many domain names as you like, and you buy these through a domain registrar. To check who owns a domain name, use Nominet, or to check who you can register a domain through, use this list here. All registrars will have different prices, so you may want to shop around to save a couple of pounds. We recommend 4UHosting.co.uk who we’ve used for the past 13 years and are UK based, with excellent support. These terms are often used interchangeably, so don’t be alarmed if the person you’re talking to uses both terms. Every website needs to have some server space where all the files of the website are stored. They are essentially separate coded files, which link together, (much like the links from this page to other internet pages), and are stored on a big computer. If you are sorting your own website out, you need to purchase some website hosting. How much space do you need (if you’re a new website, 5GB is probably enough to start with)? How often does the server backup the site? What happens if there’s a malfunction – does the server set your backup site live? Can the server space grow quickly and easily if my website traffic grows quickly and I need more bandwidth, or I need more space for a new function for the site? What support does the company offer & is it in the right time zone for me, when I need it? A shared server is usually the cheapest option, and is one where your website shares a server with many other website owners. This big computer will have lots of files and folders on it, and will have lots of traffic coming to all the different websites stored there. This can be a problem sometimes, if you’re sharing with a site which gets high traffic at certain times and leaves less bandwidth for your visitors. However, when you’re starting out, this is likely to be a good option for you. Cheapest is not always best though, as some hosting companies don’t manage their shared servers as well as others. A cloud server is a good option for growing websites, or where you get heavy traffic, even if only for short bursts. This option will store your files on ‘clouds’, thus spreading your website across a few different spaces to spread the load, spread the risk, and have more flexibility if there are issues with a site or a server. A dedicated server is one which only your website uses. You will secure the right space and bandwidth for you with the hosting company, and only you and your website technicians will have access to this space. This reduces all the risk of being infected by other websites on a server, and is suitable for those websites which need more space, and where your budget allows this level of support from the hosting company. Again there’s many options, which is often why people find it confusing, especially when they are starting out. You can start with free site on someone else’s server, like wix.com or wordpress.com, but you won’t always be able to have your own domain name linked to it e.g. mydomain.co.uk It may look something like mydomain.wix.com. If you need your own domain name, then check carefully before starting on one of these sites, as they’re all different. Then you can use premium versions of templated sites, again, wix.com or ekm.com for a shopping site. These have templates you can use to set up your site and make it look like the image in your head. If you’re wanting total free reign on the design of the site, these options may not suit you, as web developers don’t have access to a lot of the styling of the site. You can create your own WordPress website, on your own server space, or you can invite a web developer to set the site up for you. You can use free wordpress templates, which have elements of customisation, or you can choose some paid for themes (often one off charges), to create your totally bespoke site. There are also website developers who will create the site from scratch on wordpress for you (creating style sheets). Obviously, the cost goes up, with each of these options. Website design is mainly about the time taken to style the site, and then add all the functions you require. A shopping site will take longer to style than an information site. Finally, you can get a website development company to create a totally bespoke website for you. Depending on your end goal, and what you want the site to do for you, this can be an excellent option to ensure the site looks right to the customer, and the backend of the site is simple enough for you and your team to update. Still confused? Need some help? Ready to get your website started, but not sure your next steps? Contact us, and let’s talk you through your options. We have a few web developement teams we work with, plus our own in house web developer to help you fix those little bits which are causing you a headache! We also project manage website development projects from start to finish, or from whatever stage you need support.